Metropolitan Museum of Art discounts - Hotels Etc. Visit the Met...see the world! With over two million works of art spanning 5,000 years of culture, The Metropolitan Museum of Art is one of the world’s largest and finest museums, presenting the best of human creativity from across the globe—a world of great art awaits you at NYC’s most-visited attraction. Save over 5% on Adult Admission and over 10% on Senior Admission! Visit the Met...see the world! 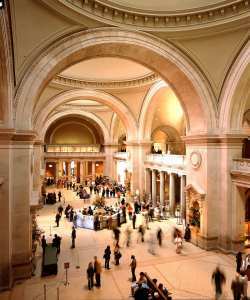 With over two million works of art spanning 5,000 years of culture, The Metropolitan Museum of Art is one of the world’s largest and finest museums, presenting the best of human creativity from across the globe. From the splendors of ancient Egypt, to the spectacular New American Wing, to inspiring treasures from the Greek and Roman world, to the Met’s beloved Impressionist paintings, a world of great art awaits you at New York City’s most-visited attraction. Our collections, some 30 special exhibitions a year, and an array of public Guided Tours are all free with Museum admission. Also, the Met Audio Guide offers a low-cost option of more than 75 hours of informative audio commentary available in 8 languages, developed by curators and educators. Plus, enjoy dining facilities and shopping at the Met Store. Admission to the Met includes same-day admission to The Cloisters museum and gardens, the branch of the Metropolitan Museum devoted to the art, architecture, and gardens of medieval Europe. Boasting unparalleled views of the Hudson River, The Cloisters is located in northern Manhattan's Fort Tryon Park.